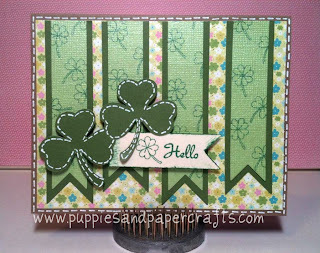 I stamped the centers of the flags with the 4 leaf clover and shamrock from Jaded Blossoms Luck of the Irish stamp set. Hello is from Jaded Blossoms Miscellaneous Fun stamp set! The colored floral backgroud is made by My Minds Eye! Thanks for stopping by! I will have another Flag Die created card tomorrow! Those are so cute. I can't wait to get mine. Love this! Very pretty! This is my favorite holiday! Green, Green, Green!